They live lives incessantly circumscribed by guidelines, parameters and regimen. But when any of the 140 persons served by Cardinal Services in Warsaw take refuge in the liberating haven of RedBird Art Studio, their personalities unfurl and their spirits take flight through their unique individualized creative expressions. Many of these special artists are shackled by an inability to verbally communicate, but their paintings, drawings, framework, jewelry, book covers, cards, decorations and beadwork deliver a message worth thousands of words. And invariably, when they finish a project, they view their masterpieces with the uncritical, joyful eye of the innocent, awestruck child. Michele Fanfair-Steury, Cardinal’s community integration coordinator, considers herself a direct beneficiary of the program. She described that epiphany as one of her “biggest ‘Aha!’ moments” since she came on board with Cardinal, courtesy of a charitable grant, when the studio opened April 12. “It is such a peaceful freeing space to know everything is just as it is supposed to be,” she said. According to Cardinal’s CEO, Randy Hall, the heartwarming blessings ripple beyond the walls of the studio, formerly the facility’s gymnasium. “I have been surprised at the talent and other benefits we have seen in helping people be more expressive,” he said. 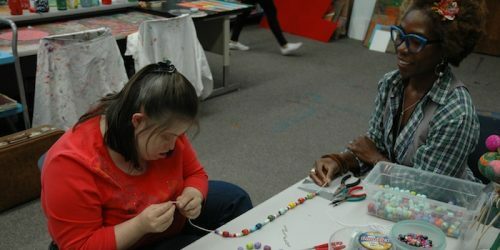 “It has also helped people in the community connect with the artists. The community will have an opportunity to view and purchase the artwork during the October First Friday weekend in downtown Warsaw. 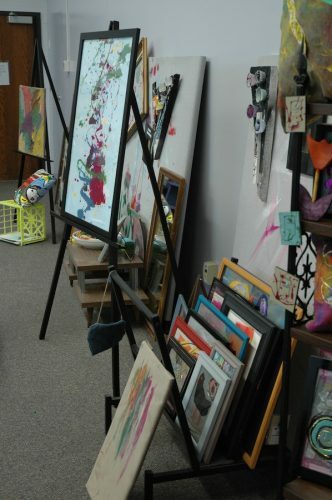 The artists’ handiwork will be on display from 10 a.m. to 7 p.m. Friday, Oct. 7, and 10 a.m. to 5 p.m. Saturday, Oct. 8, at The Vic, an event space at 110 N. Buffalo St.
Artists will receive 60 percent of the proceeds, with 40 percent going to the art studio. 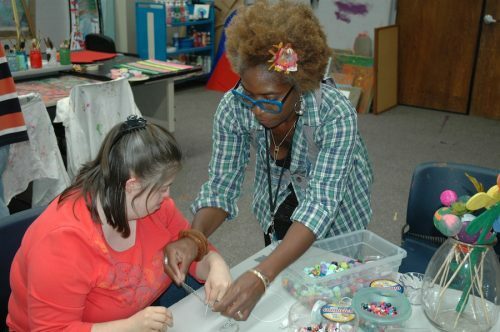 The studio is open weekdays from 9 a.m. to 3 p.m. and the public can engage in several ways, according to Vickie Lootens, director of development. The one-hour Cardinal Connection tours include a free lunch. The remaining 2016 dates are Thursday, Oct. 13; Tuesday, Oct. 25 and Nov. 15; and Wednesday, Dec. 7. “We can customize a tour date for groups,” said Lootens. Cardinal, a 501c3 organization, is also seeking volunteers and donations. At the top of the donation wish list are a pottery wheel and kiln, but “the sky’s the limit as to what we can use,” she said. Donations of material or equipment may be dropped off at the Cardinal Services building at 504 N. Bay Drive, Warsaw. Monetary donations may be delivered or mailed to that address or made online at www.cardinalservices.org. Please specify whether the funds are to be earmarked for the RedBird Art Studio. 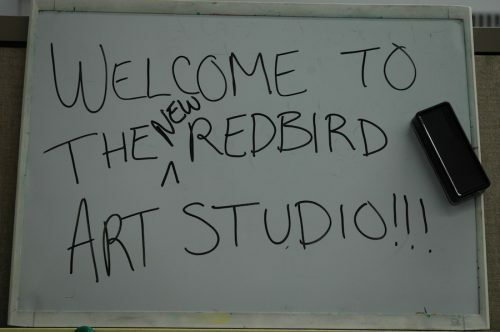 The handwritten whiteboard sign welcomes visitors to RedBird Art Studio in the Cardinal Services building in Warsaw. 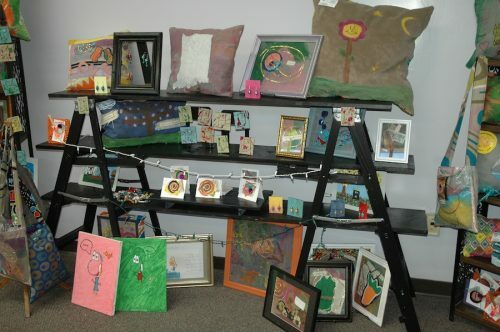 Some of the pillows and other decorated items produced by the artists a RedBird Art Studio. 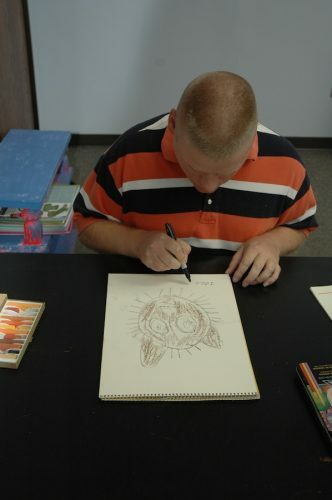 Jacob signs his drawing of a cat. Finished artwork lines the wall of RedBird Art Studio in Warsaw. Michele Fanfair-Steury helps Jessica try on her newest creation. 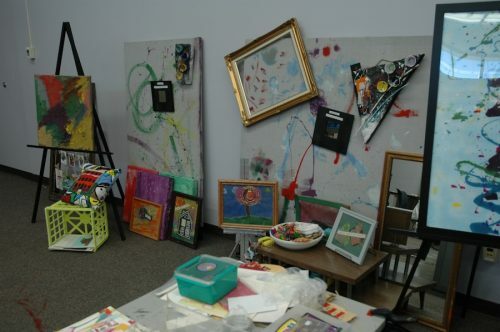 Dozens of paintings await display at the Oct. 7 First Friday in downtown Warsaw. 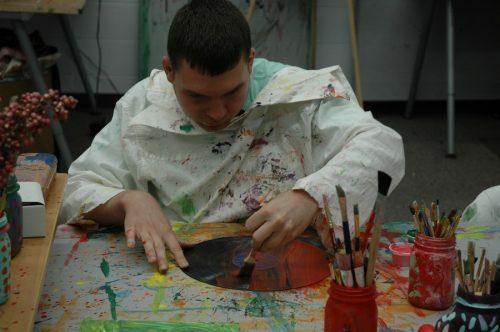 Austin paints a vinyl record for his project in the RedBird Art Studio. 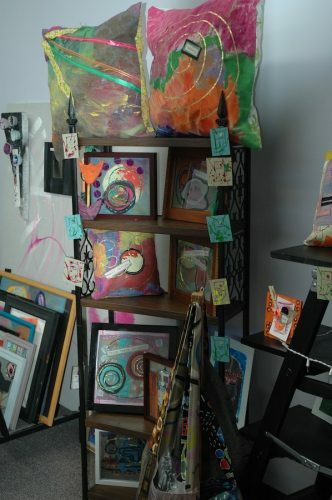 Decorative pillows and framework line the shelves of RedBird Art Studio in Warsaw. 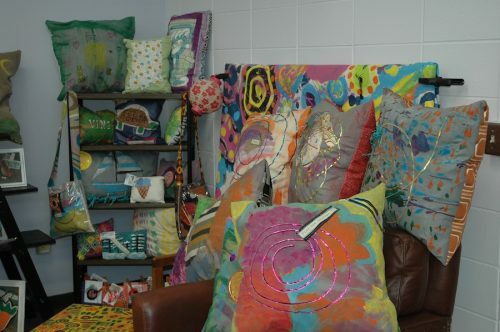 Decorative pillows are a popular art form at RedBird Art Studio.